Arden was diagnosed at such a young age that it was impossible in the early days for her to have any real responsibilities regarding her day-to-day care but it has always been our goal to transfer tasks to her as she is ready. We do so all of the time. I like the slow matriculation because it allows Arden to take on more without feeling as if things are being dumped on her. I pass on a new role in her care often without her noticing, things normalize after a little time and then that level becomes her new understanding of life. Before long Arden found herself doing things she once thought impossible, she makes decisions that she probably didn't think she had the understanding to tackle and I can see her grasp of diabetes concepts grow by the day, month and year. One thing that took longer for her to become comfortable with than I expected, changing her insulin pump. I've felt for some years that she could change her Omnipod with ease and I even could see in her eyes that she held the same belief, but no matter how many times I tried to get her to do it... she just couldn't make the leap and anxiety would get the best of her. There have a have been a few times when she has been forced by circumstances to change her own pod but those events were not exactly without drama. This weekend brought a huge leap forward for Arden, but that leap didn't happen completely organically, I had to orchestrated the moment just a little bit. Arden spent the night, armed with her new Dexcom SHARE, at her cousins house for a sleep over. Her Omnipod was scheduled to expire mid-morning the next day. I initially thought to change the site twelve hours early to avoid a conflict with Arden being away from home - but then it hit me. I thought, "I know she can do this without anyone physically with her, she may just need a little of my help". I imagined that we may need to FaceTime so that I could provide support and comfort during the process. The opportunity presented itself when Arden's BG became stubborn the next morning, it was clear that it was time to change her site. We were bolusing and temp basaling but her BG wasn't budging. I texted Arden and said that she should clear a space in her Aunt's dining room, get her supplies together and then FaceTime me when she was ready to begin. I waited for a few minutes and didn't receive any communication, I was beginning to wonder if Arden was going to be able to summon the courage to change a pod on her own for the first time without me or Kelly present. I still had plenty of faith in her so I went about my business and assumed she'd call when she was reading to begin. But a few moments later, seriously it was just a few minutes, I received these pictures from Arden's Aunt. Turns out that Arden wasn't talking herself out of it or bereft of hope, she was busy filling the syringe, choosing a site and injecting her canula like a boss. As you can see in the pictures Arden, besides being super cute, is a person who trusts herself and is completely capable. It seems as if my being with her in the past during site changes might have been be more of a crutch, than that of support. Without someone there to bail her out, Arden showed no signs of self doubt as she moved swiftly and precisely through the steps of changing her Omnipod insulin pump and did it just as fast and as well as I could have. After a few more site changes I'll going to begin to include Arden, even more than I do now, in the conversations that I have in my head about insulin dosing and BG management. So much of what I do is not based on math, it's mostly a feeling I get based on trends and recent history. Passing this knowledge on is going to take time and I think it is only going to happen through a lot of repetition - I know that's how I learned all of this. I've never said the actual number here before. I've never had the nerve to say Arden's A1c is 8.5 and no matter what I do I can't seem to get it to go lower. Back in February when Arden's A1c was at it's lowest point ever, I still couldn't tell you that it was 7.8. We had a .7 reduction in February, the biggest single leap ever, a sign that we had cracked the code and still... I couldn't say the number out loud. As proud as I was of the 7.8, I couldn't bear the thought of you adding .7 to it and realizing that her A1c was 8.5 just three moths prior. A1c is funny. Everyone tells you not to measure yourself against the number, yet it's the only number that we measure to examine the job we are doing managing type I. I understand why I shouldn't measure myself, but if not with this, how? How do I know if we are doing okay, better, worse? I tried, just as I always do, to not think about what Arden's A1c was going to be as we walked into her Endo appointment yesterday. I was doing a good job too because I was so focused on the fact that Arden was filling out the pre-visit form on her own for the first time. It made me think back to the first time we brought her to this office, she was two years old and this whole thing seemed like a bad dream. In those days the A1c results made me nauseas. One time, back when the tests took much longer, our NP caught me in the lobby as we were leaving to say that Arden's A1c dropped .2 to 8.7. I cried right there in the lobby when I heard the news and the NP hugged me because I was so inconsolable, so happy, eminently relieved. I cried because each point felt like more life, like better days. Forget the notion that we are doing something right or not, I just want Arden to live as long and as healthy a life as possible. Ironically, I want the same thing for all of the people that I love and I'm probably making far worse life choices for myself and others then I do for Arden. Diabetes is the catalyst that makes me pay attention to this degree, it is a curse and a blessing in many ways, this is one of them. Now it's six years later, Arden isn't two, and I'm not new to this diabetes thing. "It does get better", I thought as I watched her write her name on the form. Maybe not easier, but better. You'll get better, I got better, good things are coming. So yesterday when the NP told me that Arden's A1c was 7.5. I just smiled and said, "great". Sure my eyes tried to fill up a time or two as she praised Arden for her hard work. I was so proud of Arden that I didn't have time to make the connection between the number and Arden's health. I never thought of it like it meant more days, no arbitrary feelings that we did something monumental or did something that meant the literal difference between having a tomorrow and not. It just felt like an accomplishment, no different then if I had completed an exercise goal or written a blog post. I set out to do something and got a good result. Simple. If next time doesn't go our way, then we try again much like hitting a baseball. Just because you don't always get the result you desire doesn't mean that your approach is wrong, only that you are doing something that has so many variables that it is not reasonably within your control. Your job is to win the ones that you can and not let the others slow you down. I think I'm finally past the part where I think of diabetes so fu@&ing literally ever second. Yesterday, I felt happy, not relived, not like I just pulled Arden from the jaws of certain death, just happy. I think one day, if you already don't, you'll feel the exact same way because it gets better. It was a long road from 9s to 7.5 and we aren't finished yet. The NP asked me what my short-term A1c goal was and I said with some confidence that I think I can get it to 7.1. I've identified two times of day with CGM graphs where I think we can do a better job of pre-bolusing and making better food choices. Those changes should move the number toward 7.1. I'm going to start by trying to effect those moments and see where we are in three months. I'll strike out once and a while, but I bet that by the time another three months goes by, I'll have more hits then outs. This is how, in my opinion, you should measure yourself. Simply by being able to say that you are trying with every ounce of who you are. By understanding that you aren't trying to win and that it's not possible for you to lose. As long as you don't give up, you're doing perfect! I want to take a moment to list a few of the factors that I believe have the biggest influence on Arden's A1c results. When the NP asked me what my secret was I flippantly said, "Apidra, DexCom and not sleeping", but there is more to it then that. Support - Love and support from family, friends and teachers is huge. Insulin Pump - Being able to give insulin quickly and unobtrusively for meals, snacks and high BGs. CGM - Arden's DexCom is a window to the past, present and future of her BGs and I couldn't make the pinpoint adjustments that helped us get to this new level without it. It's sad to me each day that the FDA doesn't approve it's use for young people. Over night monitoring - Arden is sleeping almost half of each day, if you can control the night then a few bumps during the day don't hit the A1c average so hard. Apidra - Arden's BGs are move stable on Apidra then they ever were with the other insulin she was using in the past. Make sure you are using the insulin that works best for you... not just the one some sales person gave your doc. D.O.C. - You all give me strength to do these things when I otherwise feel like I can't. It's knowing that one of you is awake, sad, crying, happy or running around out of your mind like me that makes me realize that I'm doing okay. As we walked through the lobby yesterday on the way to our car we saw a teenage girl filling out the same form that Arden had just written her name on one hour before. This girl was just on the verge of being a woman and that almost made me cry... but it didn't have anything to do with type I diabetes. It does go so fast, just like they say. Arden's A1c is Seven. Point. Five! Standard Disclaimer: I'm not a doctor, please read the disclaimer at the bottom of the page. Always speak to your doctor, especially before trying something that came to me while I was in the shower. Stubborn Highs: Arden's blood glucose can rise and at times be resistant to returning to 'normal'. Happens to all of us. I bolus and wait but nothing, so I bolus again and sometimes again. It's around the second bolus when I begin to wonder, "is the site bad", "maybe the pump has been on too long", "did I grossly miscalculate carbs", a person can go batty trying to decide what has happened. It's likely that before you (or I) can ever come to a conclusion, the BG in question will return to 'normal' or head in the complete opposite direction. Either way, the whole unsightly mess is forgotten becasue you're busy chasing the next problem which leaves you no closer to understanding why this happened or figuring out how to avoid it next time. This type of BG struggle isn't just associated with stubborn highs: Breakfast or meal time spikes can also lead to an urge to bang your head on a nearby firm surface. Over the last few months I've been experimenting with an idea that came to me in the shower one day and I'm seeing a lot of positive results. I'm going to do my best to explain without being boring or confusing... Please note that what follows will only work for pumpers because it involves manipulating basal rates... sorry MDI and pen users! Arden is a really good eater, that is that she eats healthy foods most of the time and in acceptable portions. If the kid has one 'vice' it's that she likes a bowl of Fruit Loops in the morning - just one cup. The BG devastation that this handful of cereal visits unto Arden was, in the past, terrible. Her BG would rocket to 400 or more after a bowel of the colorful rings. The Loops would seem to laugh in the face of a pre bolus and administering more insulin before the meal or an extra bolus after could not penetrate their sugarific force field. 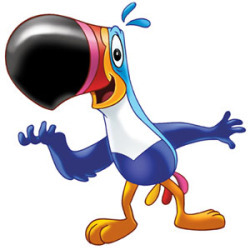 Once I even thought that I saw Toucan Sam give me the finger as I put the cereal box back in the pantry. I hate this song and dance. I hate that Arden can't have a flippin' bowl of cereal once and a while and I double hate the feeling that I live with when she eats cereal and her BG goes crazy. Foods like this don't just send her BG too high, they ruin most of the rest of her day. I'm full aware that cereal isn't a good choice for my diabetic daughter but I'm not writing about that today. Today I am talking about how, with the help of an insulin pump, we can all fight meal time spikes associated with not so great food choices and manipulate stubborn high blood glucose values more easily and smoothly. Arden's basal rate is .30 in the morning and much of the day. For a serving of Fruit Loops she requires 2 units of insulin. Giving say 2.5 units for the cereal does not change the trajectory of her BG. If I go higher (say 3 units) the spike is not effected enough, topping out at 350 and Arden's BG will plummet between the three and four hour mark. Time to visit me in the shower where I am apparently about 20 IQ points smarter then I am anywhere else. (I've heard that the hot water on the back of your neck may be the reason why). I was in the shower one day pondering life and Arden's breakfast BG spikes when I first began putting the pieces together. Overnight Arden's basal rate is .20, if she's high I have to put her basal back to .30 for a bolus to have the desired effect... I wondered what would happen "if I increased the basal beyond .30", could I bring a high BG down in a safer way, steadier perhaps (because she's sleeping) then if I just bolused? I tested my idea at the next opportunity and not only did a significant temp basal bring down the high overnight BG but it did it with less insulin then a bolus would have required and the drop was smoother, it's 'landing' less erratic. My inner mad scientist was intrigued and I had just unknowingly found a big piece to the puzzle that is stopping mealtime spikes. Proof of concept: Arden sits down and begins eating on a school day at 8:20 am. Today at 7:45 am her bg was 140, I bolused for the first 15 carbs of her upcoming breakfast, which was 1 unit or half of what a serving of Fruit Loops requires. This is a pre-pre bolus, I find that after a long night of no boluses and a decreased basal rate it can take a little longer for insulin to begin working (maybe this is part of the morning insulin resistance many experience?). At 8:10 am I bolused again this time for the remaining 15 carbs but I reduced the 1 unit of insulin by .30 (the equivalent of an hour of Arden's basal rate). Last, I increased her basal by 95% for one hour. (OmniPod won't do 100%), giving the last .30 of the 2 units via an increased basal rate. The temp basal in conjunction with a significant pre bolus seems to be the key to eliminating a BG spike. Pre bolusing alone won't effect a severe spike enough because you can't perfectly sync the insulin peak with the food spike so the BG rises quickly, drops suddenly and often bounces back up. However, when you add a pre bolus to a significant temp basal, the basal acts as a constant drag on the spike and the two together win out. I can prebolus that far off in this situation without an issue because her basal was .20 all night and she's resistant in the AM, so the insulin is a bit slower to respond first thing in the morning. Plus, with Apidra, Arden rarely experiences significant BG falls so prebolusing this far out feels safe. Additionally, I have 70 points in her BG to play with and the cereal will be releasing sugar into her blood far before she gets too low... (having a DexCom CGM doesn't hurt either). This insulin won't begin working until after Arden begins to eat, so I'm not worried about stacking. Two boluses also mean two insulin peaks while the Fruit Loops are trying to spike her BG. Double the basal rate for an hour to complete second 15 carb bolus. This .30 will work better then if it was given as part of the bolus, why? I don't know, I told you, I'm not a doctor... it just does - Maybe I know this because hot water in the shower makes me smarter. btw, more then an hour of the temp basal is too much and results in a fall in the 3-4 hour range. Doubling for an hour is perfect. Result: At 9:30 am Arden's nurse called... Arden was 240 by her CGM. The CGM indicated 2 arrows up (which was why she was with the nurse) but the double arrows only lasted for about 4 minutes. So my little science experiment took a double arrow up event that in the past would have sky-rocketed to 400 (or more) and held it to a 4 minute double arrow that never went above 250! Arden's BG (by the CGM) at 11 am (pre recess) was 145 diagonal down, she drank 2 ounces of juice (7 carbs) and went outside to play. When she returned her BG at 11:30 am (post recess, pre lunch) was 129 by a finger stick, 140 and steady via the CGM. I choose and extended bolus for lunch because she was having a bagel. 60% of the 2.20 units at 11:30 am the balance over an hour (to combat the slow breakdown of the bagel). Her BG was 145 three hours later before snack time. It goes without saying that what works for Arden won't work for everyone but after months of using this method I am 100% comfortable telling you that what I wrote here is well worth speaking to your endo about. The concept of using a temp basal to complete a bolus holds many possibilities beyond what I wrote about here today. Slow to break down foods and high carb meals for example are also good places to try this method. I'm using a temp basal as part of Arden's bolus on almost a daily basis. It is also invaluable in bringing down stubborn high BGs and getting a BG lower during sleep, avoiding the fear of a sudden drop and without going too low. I wish you all good health, luck and steady BGs. I'll do my best to answer any question if you have them. Looks like Sanofi will have the supply of their Apidra SoloStar pen back to normal levels in the second quarter of 2012. Sanofi has made the FDA aware of their timetable and SoloStar users should be happy again in just a short time. The company has produced a web page that can help a SoloStar user navigate the supply issues and they've also extended their free Apidra offer as a way to help soften the sting of this inconvenience. We've taken advantage of the free offer even though Arden doesn't use the SoloStar pen... Nothing better then free insulin, right? Arden's A1c is at it's lowest ever since we switched to Apidra so I'm more then excited and happy to let you all know that it's out there and for a while longer, free. Yesterday was Arden's quarterly endo appointment and it could not have gone any better! At her last appointment her A1c was in range but a bit higher then usual, though still at the high end of acceptable for her age. Arden's A1c is always very stable and in range but never as good as it could be. Our endo likes that it's steady, I am usually unhappy with the number and trying to make it lower. 10, 9 ,8, it counted down, 7, 6, 5, I actually said, "c'mon be lower", 3, 2, 1... Test complete. It wasn't just lower then last time, it was .7 lower! Almost a full point! I held in my excitement and made my way back to the exam room (where Arden was blowing up a sterile glove for our now traditional game of VolleyGlove). I told her how far her A1c had fallen, she smiled coyly and offered a high five or three. Then we volleyed that glove like it was our first time. The NP came in a few minutes later and she began asking the standard questions but I just couldn't wait. I said, "did you see her A1c yet? ", she replied, "no". I responded, "Well I have and it's amazing!". She asked me what it was (I don't share Arden's exact A1c here) when I told her she began clicking furiously on Arden's file and found a list of past test results. "I thought so" she said... "lowest EVER! ", she congratulated Arden and then me. I found myself thinking that my smile must look ridiculous because my face felt like it was about to break. As soon as we got into the car I called Kelly to share the great news and we celebrated all over again. It's ten hours later and I'm still as excited as I was in that exam room. Even when things are going well with diabetes it can still feel as if they aren't. Yesterday was a much needed and well deserved chance to celebrate and feel accomplished. I hope everyone gets a day like this very soon, it was reinvigorating.